She is one woman who is passionate about fashion, style and keeping herself groomed well. So much so that she keeps other women in the FASHION & LIFESTYLE COMMUNITY on SHEROES, motivated through her consistent posts. Whether she gets enough accolades or not, her fashion-style related posts just keep coming. And that's what caught the fancy of our eyes at SHEROES and we decided to know more about Seema Sharma. She hails from Gangtok in North East India and post-wedding she moved to Rampur in Uttar Pradesh. "Mahima Ma’am, I am a 39-year-old woman who hails from Gangtok, Sikkim as already known to you. But since the last fifteen years, I am working as a teacher/Coordinator in Sr.Sec.CBSE school in Uttar Pradesh. Are you intrigued about me since I am a teacher who loves to talk about fashion at SHEROES?" She laughs when I say no since I didn't know she was a teacher. But then her interest in something beyond her profession surely is hooking my attention to know her further. And she replies on phone, "People think what a teacher has got to do with fashion and style. And I say that a lady with grace must do everything to look good, to feel good about herself. Not just sharing about style on SHEROES, I am really ambitious to participate beauty pageants. I am fascinated with it but unfortunately, due to my busy schedule, I am unable to do so. Nevertheless, I really feel that all my passion is fulfilled through SHEROES. And in turn, I motivate women to look good, to stay happy." Stay happy? Does she talk about looking good and staying happy? What's her own story behind it. 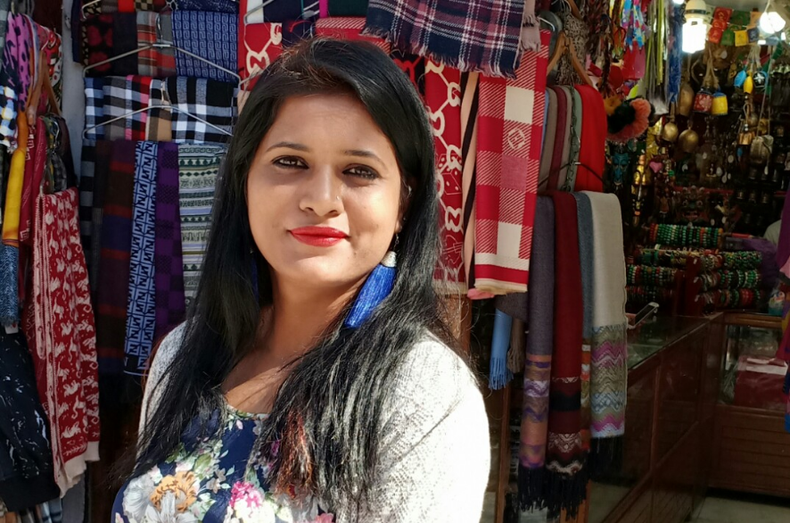 Seema says her drift to Rampur from Gangtok also brought in cultural changes in her life. And this applied to her day-to-day life as well as what she wore. She told me on the phone that she used to wear Western attires when in Gangtok, but things changed to traditional Indian attire post the shift to Rampur. But after her daughter was born, she decided to be the change in terms of kicking away patriarchy, but in an amicable way, motivating her husband to be her support. "Well! It was quite difficult in the initial period as I have come all the way from the capital city of Sikkim down to a small town in Rampur District. Gangtok was a different world. Though North East is among the most neglected part of the country, let me tell you, is it great in terms of Gender Equality. You are free to wear what you wish to, unlike Rampur. In Gangtok people care for each other and their emotions, thus every respects your personal space and never imposes patriarchal rules. Rampur is quite the opposite that way. Though the tradition, culture, climatic conditions, and environment as well, were completely new to me still I had my ever supporting husband and to guide me in all pursuit....all became comfortable......Now I feel as if I was born here, but then it took me time to adjust and also to rediscover myself," says Seema. But the ride wasn't that easy, and I can sense it on phone...I can sense that she is fighting back emotions as she reveals, "My husband began getting seizures just when I had conceived our first child. Financially we were not that sound and I took up teaching to support my family. I lost my first child due to certain medical complications. While we were just coming to terms with this trauma, my in-laws passed away in two years of time. Things were just going down the hill. And I just held onto a thin thread. I had my husband as my only emotional support, my job as the only financial support until my daughter was born. And seeing her face, I began getting motivated to break all barriers in future. I became strong-willed, focused and set targets to achieve the better part of life. And by the grace of God we are a happy and financially stable family," Seema says as I feel a sense of relief and perhaps a smile too...just like the Sun shining through the clouds. How do you manage home, work and your passion for fashion Seema? She laughs aloud, "Well, it is a myth that women take time to dress up well. If you make it a habit to respect yourself, love yourself and look great, it becomes a part of your daily routine! Try it, you will tell me a few days later that it feels great to look good and groomed when you look at the mirror. It boosts self-confidence." And for her own self-confidence, she has a word of thanks to some from the SHEROES COMMUNITIES, "I am really very fortunate to be the member of Sheroes family. If I think of it, it seems to be a dream. I am really blessed by Sairee Chahal Ma'am, Davinder Kaur Ji, Merril Diniz, Yashmita Singh, Mahima Sharma, Chandini Wig, Shiny Hoque, Dr. Adi, Shruti Gupta, Nidhi Thawal and all the SHEROES who have stood by me, but I might have missed out. You people have made me what I am at SHEROES. I am dying to meet you all, thus I would love to be the part of the SHEROES SUMMIT and share my joy in person." "Just believe in yourself that you're special....you're born to win.....keep positive attitude....take the things easy.....be calm and composed.....and always keep smiling as it will always increase your face value and boost you up with utmost confidence." If #HerStory of determination to beat all odds, has touched your soul....do share it amongst all your friends. And also don't forget to pour some love for Seema Sharma in the comments column. You can follow her at SHEROES. An award-winning Independent Journalist & Content Curator based in New Delhi. She is Ex-News Editor, CNN-News18 and ANI (a collaboration with Reuters) who comes with an experience of 14 years in Print, TV and Digital Journalism. She is the only Indian who finds a mention in the Writers' Club of Country Squire Magazine, United Kingdom. Sufi at heart, she also has some 30 poems to her credit at various reputed international podiums. Seemaji, you always rock. In fact you are like a magnet of Sheroes that attracts everyone towards you. You have a splendid charisma of your own. We are very proud of you dear. Seema you've got all it takes to be a style queen.Luv u ...luv your style.